At this point it was almost time for us to leave on Christmas vacation. I absolutely had to get the place ready and listed before December 31st if I wanted to be able to deduct everything I’d spent on it this year, and I knew I’d never get it all done in time. So I had to bite the bullet and do something I never do…. ask for help. I found a good, if pricey, contractor and wrote a two page list of everything that still had to be done. And wouldn’t you know, they finished all that work in only 4 days! 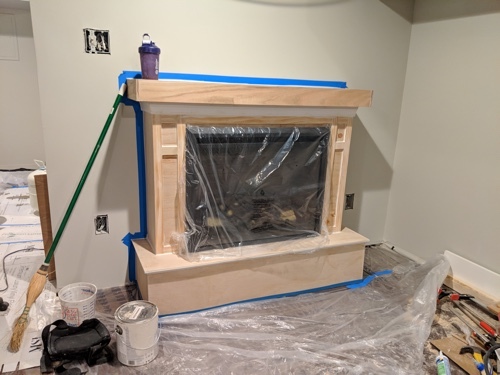 Doesn’t that fireplace look nice?? And added the “window” banister upstairs. Because of their help, it was rentable by December 25th and I did get it listed in time! 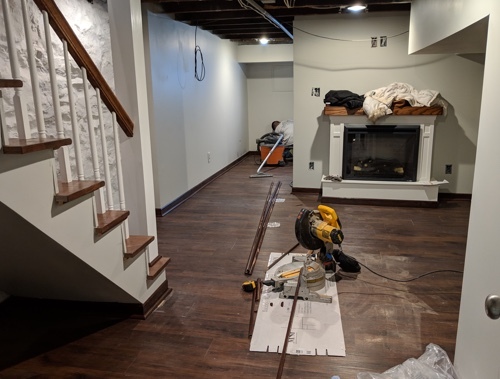 I used photos from the original listing, since I still need to do a giant cleanup and carry out several truckloads of tools and supplies from the basement. And after that’s done it’ll take me forever to get Josh in there to take professional photos… but I can’t wait til you see it all cleaned up and gleaming! 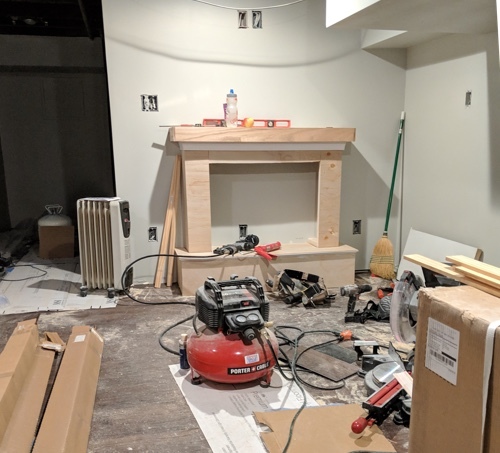 Once the floors were in I could start building the crowning jewel of the basement – the fireplace! 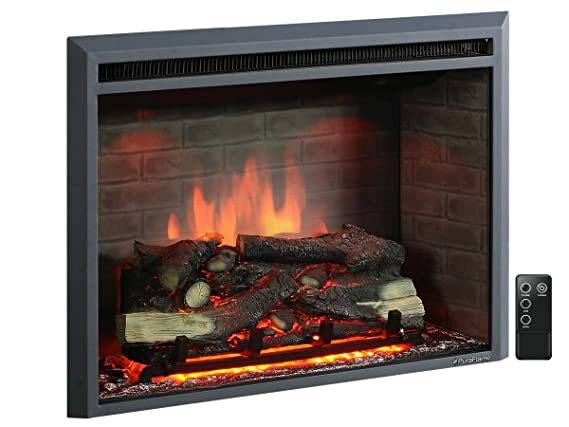 We bought this fireplace insert from Amazon because it was the most highly rated. 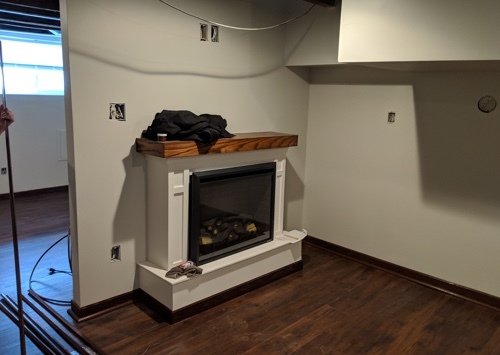 I had wanted to direct-plumb a real (but ventless) gas fireplace, but ventless fireplaces are super expensive. Plus, gas makes me nervous – probably because I’ve never lived with it. But still, it introduces risk to the tenants so I decided to go a safer, if less impressive, route. Electric would have to do. 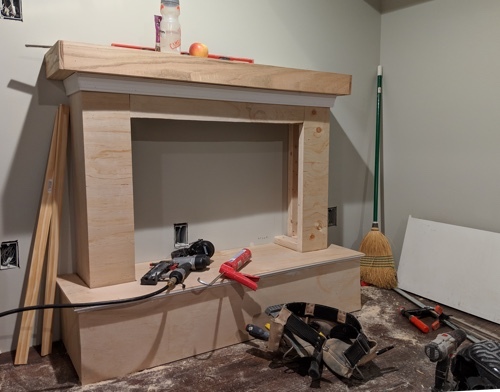 Started by adding a couple of ledger board type things along the back of the mantel and the back of the hearth. These are screwed across the wall and into the studs with 3″ screws. 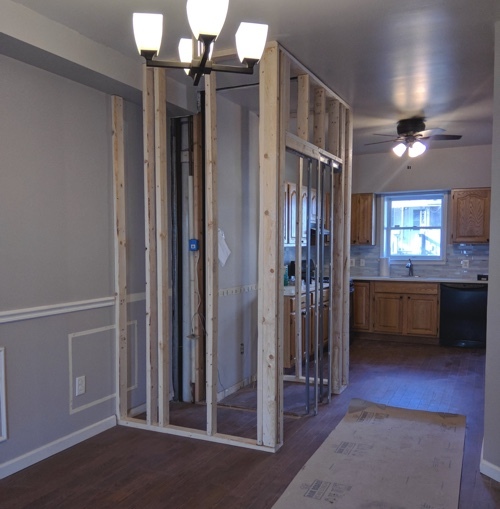 They provide me with a way to attach whatever smaller parts I need to later without worrying about using drywall anchors or shear force or whatever – there’s wood wherever I need. Speeds up the process a whole bunch. I added window moulding under the mantel and thin corner cove moulding all along under the lip of the hearth. 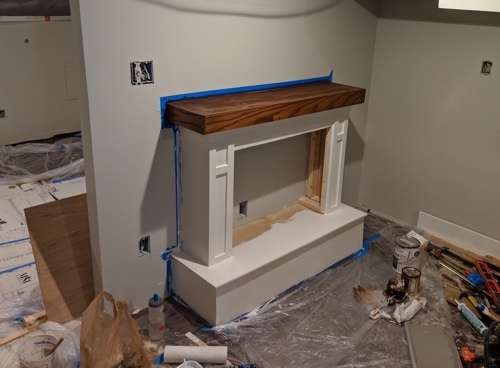 These would be painted later, but because I wanted the mantel to be stained rather than painted I skinned over its framework with 1/4″ real oak boards. She begs to come along and help with painting! 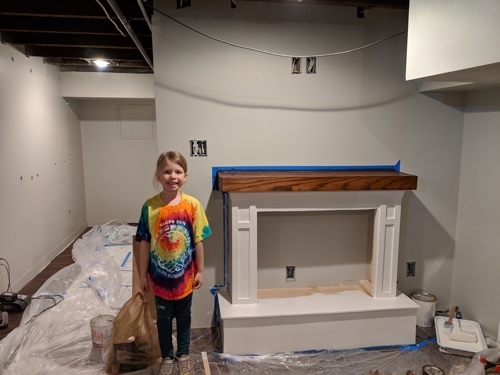 I used the same stain on the mantel that I used on the upstairs railing. Doesn’t quite match the floors, but it’s as close as the Sherwin Williams store could find. I did a couple coats to make it as dark as I could. 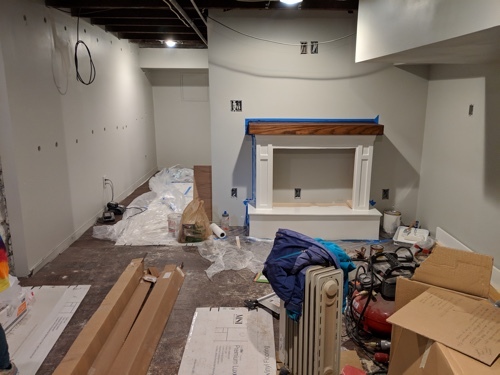 Looks pretty good… Can’t wait to get the baseboards and have the electricity finished up enough that we can put in the insert for real! With framing and drywall up and the sticky insulation filling the walls all taken care of, it was safe to lay down my pretty vinyl floors. 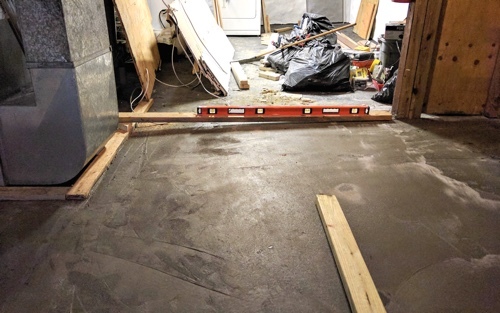 But because the concrete was still so uneven, and because the contractors had done such a bad job adhering it to the original concrete that it was already cracking in places, I first had to lay down subflooring. 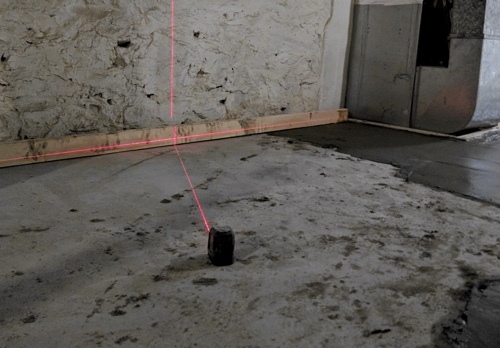 This would provide a smooth surface for the plank flooring and also disperse weight from people walking across it. That also meant that I first had to lay down a thick plastic vapor barrier to protect the wood from direct contact with the concrete. 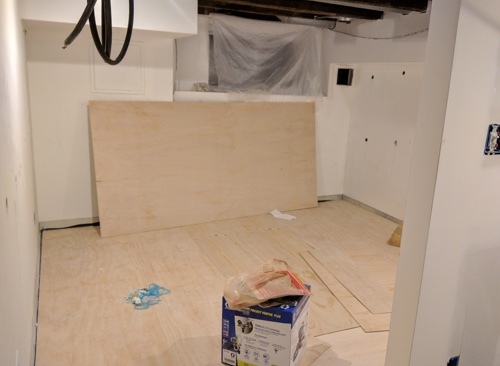 I used 1/4″ plywood because I didn’t want the floor to be any higher. 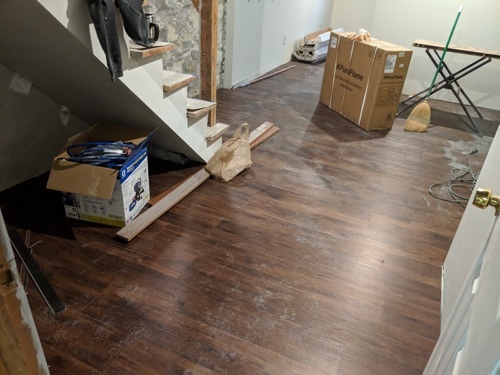 I wish I’d gone with something thicker though, like a standard 3/4″ board, because the sheets were flexible enough that laying the planks on top afterwards was difficult in some parts. Every board had to be screwed down to the concrete floor in like twelve places, so I went and bought myself a new hammer drill. It’s called a rotary hammer – I didn’t even know there were different types of hammer drill, but this kind is amazing. It cuts through concrete like butter! So many sheets of plywood. So many screws. But then comes the fun part! I bought these vinyl planks from my favorite discount flooring store and was lucky enough to find them on sale. I only needed about 335 square feet, so twelve boxes were plenty. They clicked right into place and had their own insulation and cushioning attached. Except for the areas where the stupid floor dipped and rolled and the planks had some trouble flexing around it. I do worry that the planks may some day come apart in those areas. But in the mean time, it looks pretty great! In fact, it looks good enough with the color of the ceiling that we decided not to drywall or paint it after all. Kind of reminds me of a fancy restaurant or wine cellar! 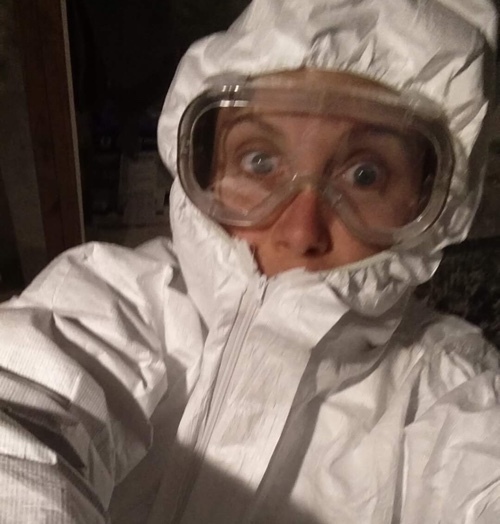 I had my first adventures with foam insulation! 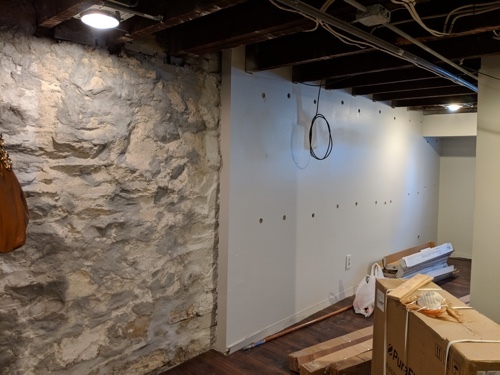 The walls downstairs were built of regular old drywall right against the original stone walls. 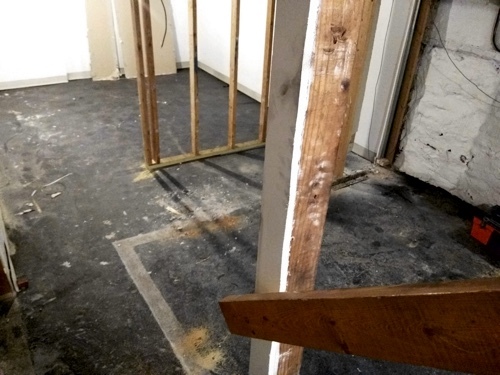 No vapor barrier, no insulation, not even using all metal studs. Can anybody guess what damp, clammy stone walls and untreated wood and cardboard leads to? Luckily, it was done recently enough that nothing had started yet. But give it a year or two and it’d be a fungus lunch buffet. 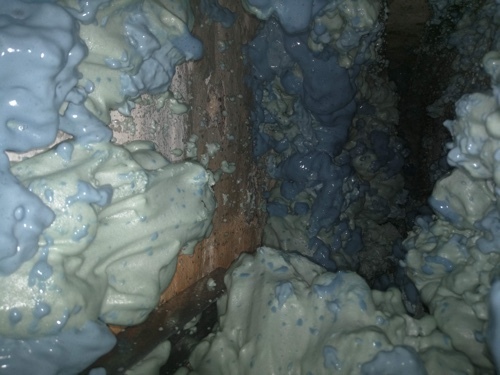 So that’s not ok. Can you picture a situation where we develop black mold and a tenant sues us for health problems? Or we need to suspend their lease for a few months while we rip out all the drywall everywhere and redo the entire basement? NOT OK. Stink. Health. Damp. Cold. Boo. Two solutions. 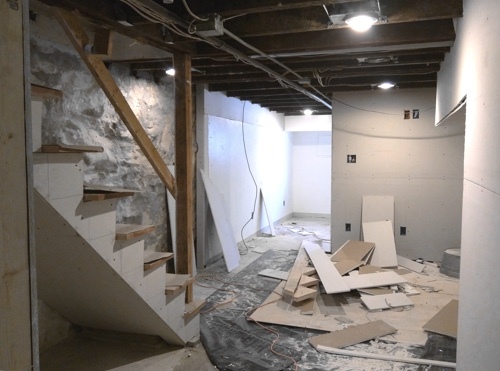 1: rip out all the drywall and studs. 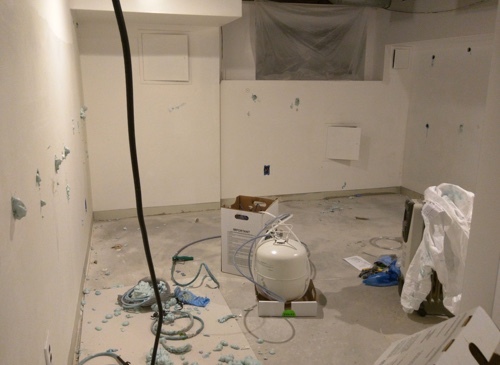 Replace with metal studs, vapor barrier, insulation, and get all new drywall installed. Probably the best way to go but also $$$. 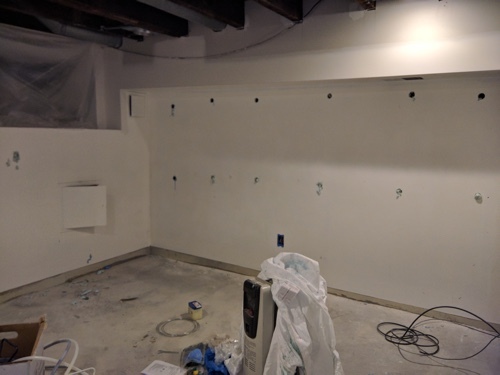 Option 2: open up the existing drywall enough to fill the cavities with expanding foam insulation that not only will fill all the gaps and stone crannies, but when it dries will act as a 4″ thick plastic vapor impermeable barrier? SCORE. Can you guess which one I chose? I did a bunch of research and found a company, FoamItGreen, that not only offers the right, special slow-rise product but is the only spray insulation company to offer free shipping. Plus super clear instructions and great customer service. And no, I’m not affiliated with them. The first step was to cut holes in every single stud cavity, every vertical 3 feet. Which turned out to be A LOT. On 3 walls. Bah. They sent me two propane-looking tanks and a long, bifurcated cable with a gun on the end. 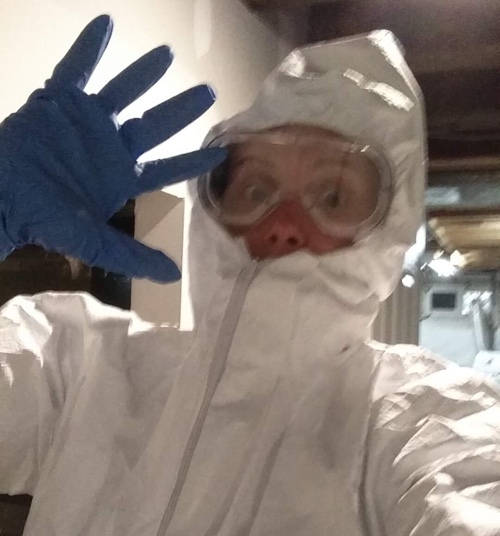 Plus, they include allllll the extras you could possibly want: glasses, a full Tyvek suit (which I’m TOTALLY keeping), cocktail-length heavy duty rubber gloves, shoe covers, goggles, and probably some more things I’m forgetting. I just had to squish some clear tubing onto the end of the gun to be able to poke it in, and then squeeze, and fill ‘er up. Layer by layer. So, the different colors are because I was doing it wrong. I was still adjusting the input from either tank but I did eventually get it right. (PS: their customer service returns calls, like, immediately. Kudos, FoamItGreen.) That mint color is what it’s supposed to be – an even mixture of the blue and yellow liquids, of which I guess one is foaming and one is hardening. In the end, much messier than I had thought it would be. I’d drip on the floor and then step on the drip and then on the plastic and then the plastic would stick to my shoe and smear on other plastic and back on my leg and then there was sticky-as-caramel foam EVERYWHERE. It helped to have a big ole off-cut of drywall to set the gun on whenever I needed to trim the end off the tubing or had a drip or whatever. Oh, and the drywall nail pops from where I accidentally overfilled and the foam expanded enough to pop the drywall off the studs scared the poop out of me. As did the realization that this stuff gets hot as it cures, which I only found out after I had coated the gas lines in it, like, six inches deep. I left early that day. The foam was a lot more difficult to scrape off the drywall than I had imagined. Starting the second row, I first taped up plastic all along under the line of the holes, and lined the edges of all the holes with painter’s tape. Overall, though, it was a really satisfying project. And you can REALLY tell the difference in the rooms down there – they feel like a normal room instead of a dank basement. They’re about as warm as the upstairs and don’t smell… well…. 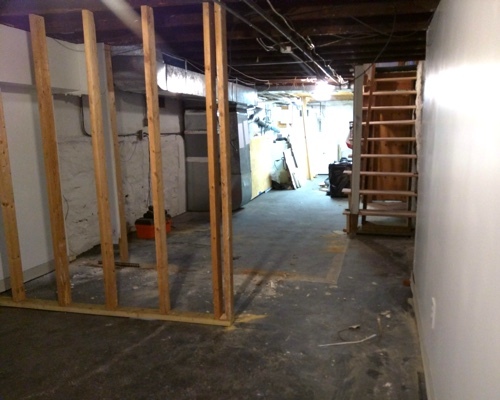 basementy any more, making it a much more inviting space. A railing, ladies and gentlemen, we have a railing! Came in late one night to show my parents around and look what I found! Jason The Railing Guy had been busy. Because of the complicated angles and terminations, I had hired someone to do this project for me. I’m so glad I did. Jason’s work is beautiful. 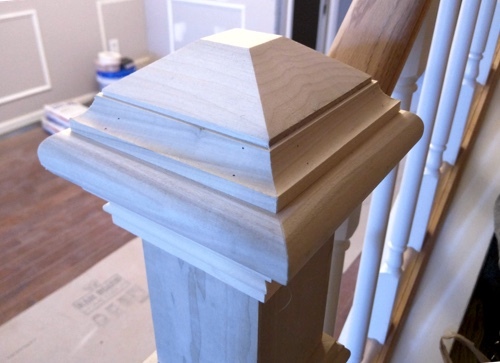 Look at his joinery! 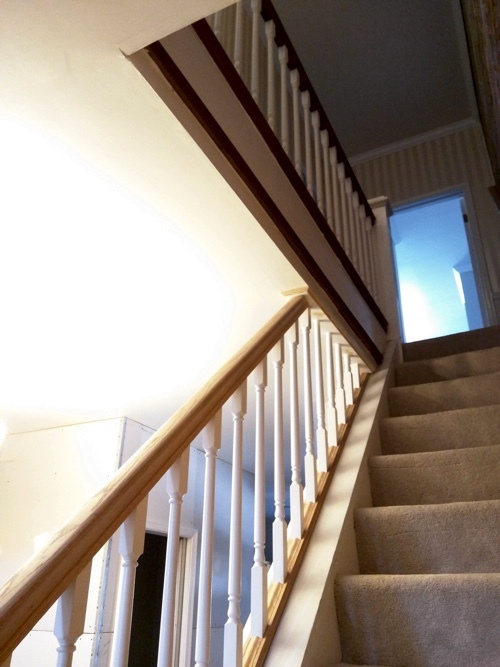 I had kind of felt that having someone else do this banister was an expensive excess, but I no longer think so. It makes a statement and looks just beautiful, and that’s important given that it’s the first thing you see in the house. Absolutely worth it. Wish I had enough to have him do the “window” and the downstairs banister too. I got the remainder of the basement framed in just two days! That’s gotta be some kind of record for me. 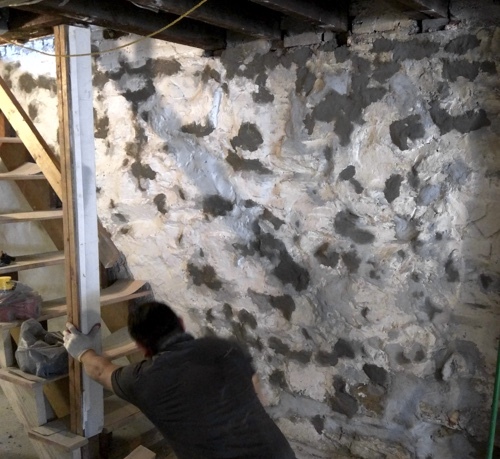 The reflective bubble wrap behind the wall is not only insulating but also acting as a vapor/moisture barrier for the stone wall. I have it running all the way up, under the air returns and folded around the closest edge in the hopes that it will prevent the condensation that so often discolors drywall under air returns… or if it doesn’t prevent it, maybe it will at least keep it from reaching the drywall underneath. And then I totally forgot to take a picture when I was finished. OF COURSE. Because I am still me. But it was neat and lovely to see and I was proud of myself. 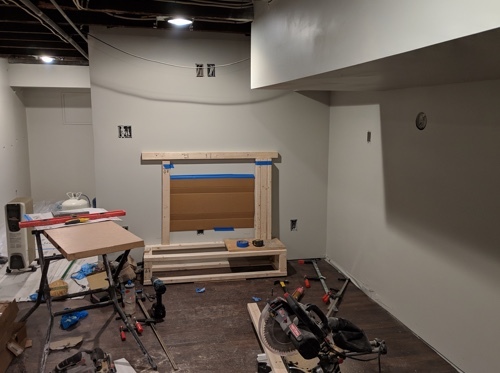 Once I had the framing in place the electrician was done with his work in two days, so I called the drywallers on the off chance that they were free. It turned out they had an opening the very next day – that NEVER happens! So I was literally hammering in the last few chunks of wood when they began working early that morning. It looks so different with the drywall up. The air return bulkhead looks a lot bigger that I’d pictured – partly because with the heightened floor and the framing, I can no longer quite stand underneath it. I was worried that the can lights above would cast dark shadows underneath that bulkhead so I had the electrician put in two downlight boxes underneath. I’m thinking people can put a sofa under there and there will be some soft reading light. And hey speaking of can lights, did you notice how much brighter the space is now? Look at the first photo above for comparison. Between the two photos the electrician finished installing all the lights. Even though only every other one of the lights is lit, it’s still so bright in there! Didn’t look great at first. 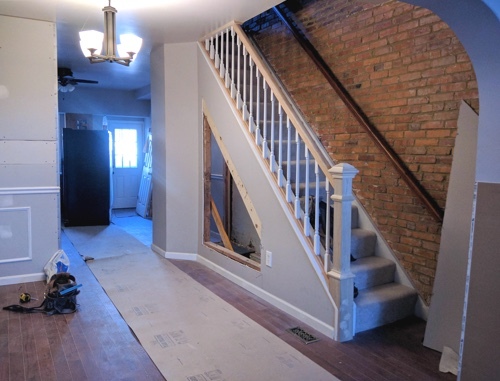 But once it dried, and now with the staircase boxed in, this area is so much closer to looking like a finished space! I was nervous that I’d do it wrong. I was afraid I wouldn’t be able to carry that many bags of concrete. I’d never used an angle grinder and it all seemed too scary and difficult. I didn’t know if I’d be able to strip the paint off well enough to get a good adhesion. (The workers omitted this step entirely). I wish I had trusted myself. Once I started, grinding down the concrete was not only easy, it was kind of fun! 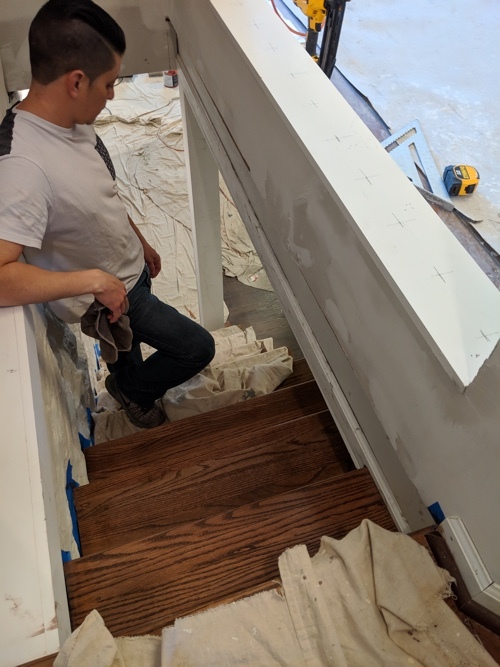 As for the bags of concrete, I barely had to transport anything – I had someone at Lowe’s load them into the truck for me and then once at the Townhouse I just slung them down a makeshift slide inside the basement window. I now love using self-leveller – it’s so satisfying to see it creep and smooth itself out. I would have saved money, used better quality products, and had ceilings 2″ higher than I do now with a flatter end product. Probably would have taken the same amount of time, all told. 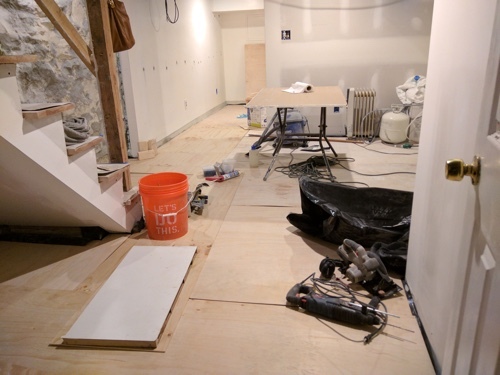 The contractor did send a guy back the following week to bust up the most egregious part of the floor. 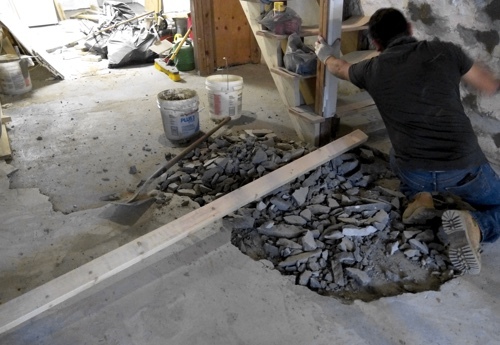 It took him several hours even though the concrete came up relatively easily. Because, surprise surprise, the workers had not scraped the paint underneath at all so there was zero adhesion. I could just yank pieces up with my fingers. He took up quite a bit while trying to cut back the slope. When he left (snuck out while I was gone to fetch the girls even after I made him promise to stay until I got back), the floor still wasn’t level. Hard to tell from the angle, but on the left the laser ends up about 1/4″ from the floor and on the right it’s a bit more than 1″. 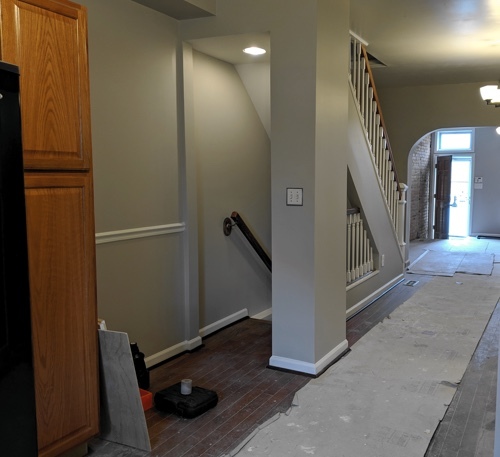 But the contractor refused to do any more on the grounds that he had said from the beginning that it wouldn’t be absolutely perfect. While true, I guess his definition of not-quite-perfect and mine are very, very different. I threw up my hands and got to work. Ah, Construction Chic fashion, you are not my friend. I used a total of 6 bags of self-leveler – and it could have been significantly less if I’d remembered to buy pea gravel. 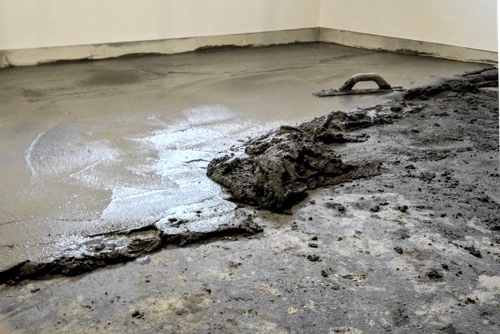 Self-leveler can only be applied about an inch deep but you can double that by using pea gravel to bulk it out… good to know with a product as expensive as that. I could probably have used another 3 bags, but in conjunction with grinding down the high spots it was Good Enough… plus I was already behind schedule. I may still end up having to add more under some of the lowest spots, we’ll see. Usually I end up being incredibly glad that I hired a professional. This time, I wish I’d done it myself from the beginning. I guess I can chalk it up to a learning experience. In the mean time, the important thing is that I can now start the framing and we can really get the project rolling! 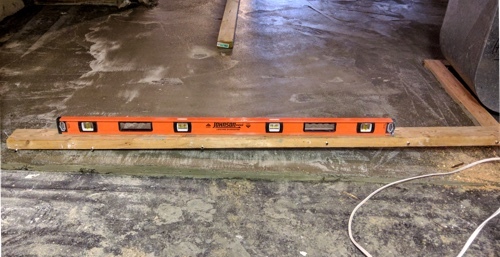 Concrete to level the floors came in last week… the day before my birthday! I was so excited. 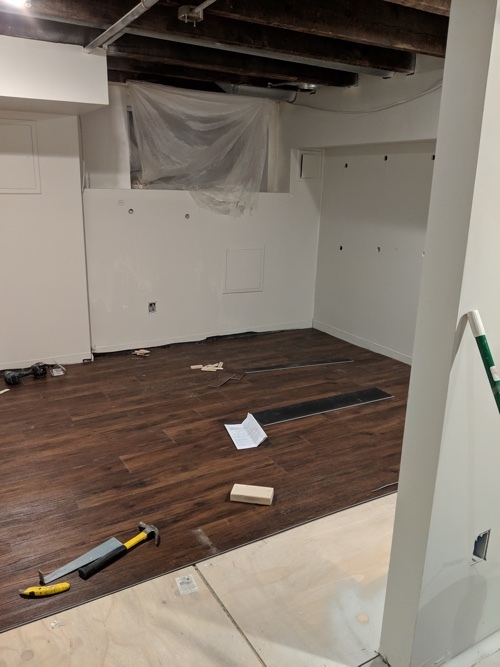 Dreams of having the floor puddled, perfectly level and ready to roll with my gorgeous vinyl plank floors (which are notoriously picky about the flatness of the surface they’re applied to). I figured they’d flood the floor and that’d be it, right? They actually transported in dozens upon dozens of bags and did the mixing right there on the floor. One guy was in charge of glooping the peanut-butter-consistency stuff onto the floor and making sure it was smooth. By the time I got there after putting the girls on the bus, they were almost done with the office. 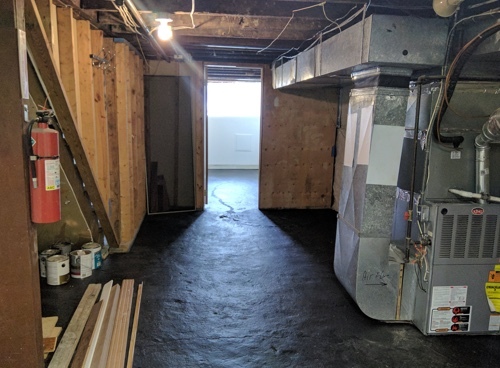 I had expected that they’d only apply concrete up to the highest point of the room and taper it off there in order to keep the ceilings as high as possible. That kind of feathering-out-to-nothing is only possible with self-leveler though, which is a crazy $35/50lb bag. 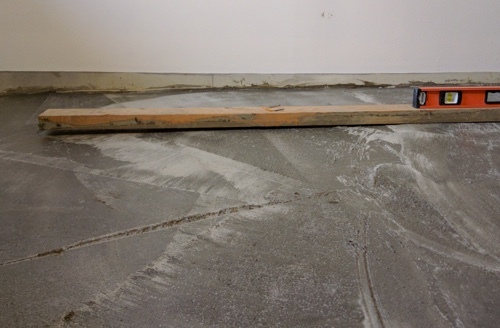 Regular concrete is only a few bucks per bag but it has to be applied at least 2″ thick or it may crumble. That’s almost two inches thick at the highest spot, which lowers the already low ceilings. And does that look flat to you? 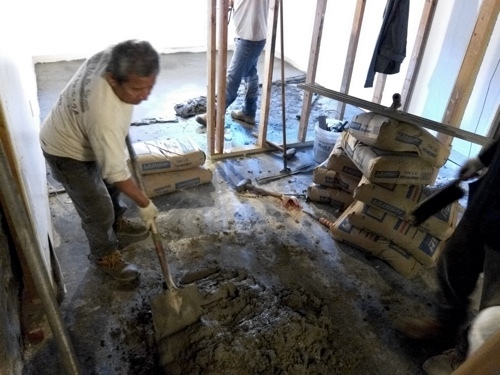 But these guys have done fantastic work for me before (the sidewalks and front walk on the Beach House), so I left them to it and figured they knew what they were doing and that they probably planned to fix it once they had the whole room done so they could level and screed it more accurately. Can you see how over a 6′ span the level is already up an inch? It gets worse the farther you go. Here’s another. You can’t lay vinyl plank over this gap in the middle. It will buckle and crack. The dip looks small in the picture, but it’s actually more than an inch deep. It was like at the end of the day they just gave up even pretending to be aiming for level. They piled 2″ of concrete on the highest point in the entire project and tapered it down to nothing on the lowest side! 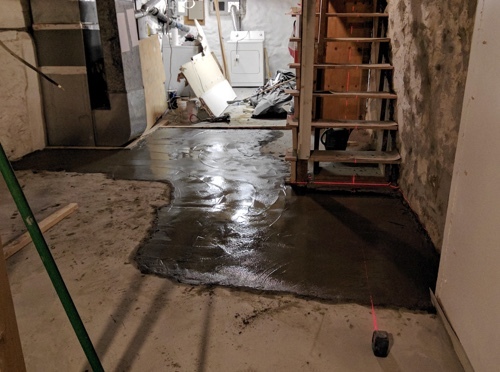 Can anyone tell me why the concrete guy didn’t just use liquid concrete in a truck like normal, just flood the basement and be done with it? Wouldn’t that have made more sense – been easier to transport, faster to finish, and a cinch to level? Is there some reason he chose to do it this labor-intensive, error-prone way instead? Anyone know something I don’t? If there is, I really do want to know. Let’s just say I learned my lesson about supervising concrete work. 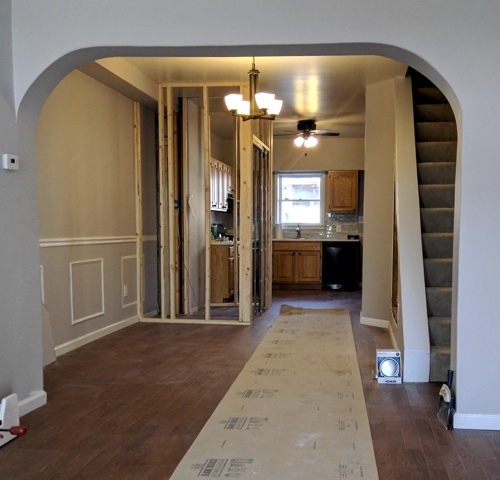 If you have to leave for some reason during drywall or framing, fine. Those mistakes can all be redone. But concrete is, of course, more permanent. I should have called Josh and told him he’d have to get the girls. I should have had him make dinner and take them to gymnastics. He would have, if I’d asked. I wish I had. But I was tired, and I wanted to go home. In the end the contractor did agree to come back and fix this back corner for me, but not til the following week, which put me further behind schedule. The icing on the birthday cake? When I was leaving, I saw someone had crushed the back corner of my truck while taking a corner too tightly. (Luckily, he stayed and I got his insurance). 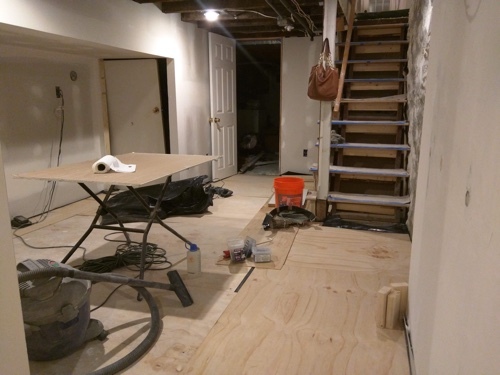 Things are happening upstairs too – I’m really impressed with the contractor I hired for that job. So nice when people exceed your expectations. Wow! Fridge moved, wall gone, new bathroom framed out perfectly! He remembered my request for a pocket door, too. But that would have made the dining room pretty dang small, so I’m happy with my choice. I love having contractors do stuff for me. It makes me incredibly energized. Their speed and accuracy is impressive and it’s exciting to see the project progress so fast under their hands. 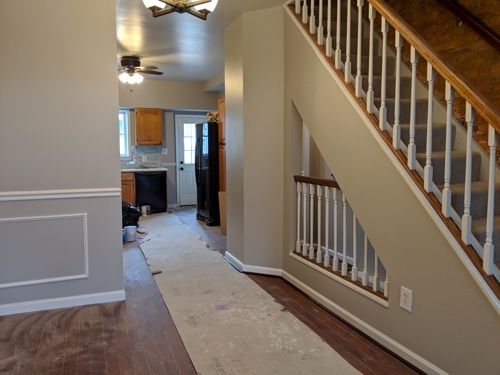 If I had money enough to just have contractors do every single project, I would be over the moon about this career all the time! Instead I slog through at a snail’s pace, full of frustration and backaches and slowly disintegrating joints… but I have to keep reminding myself that the feeling of accomplishment at the end is its own reward. There’s really nothing like it – just gotta get there first. 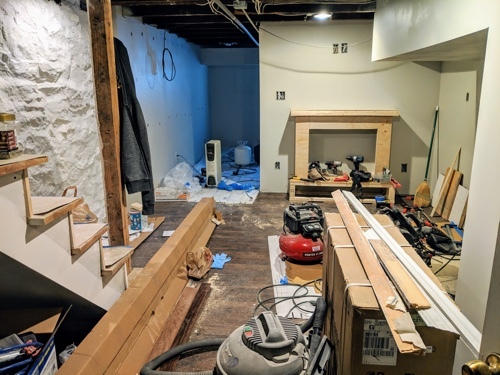 Ever since I realized that I couldn’t excavate the whole basement and that I’d have to cut the family room off right at the back of the stairs, I’d been struggling with unsatisfaction with the resulting size of the room. But I hadn’t wanted to move the bedroom wall to enlarge it because I still thought that front space was going to be a bedroom. I wanted to at least compensate whoever had to sleep in the basement with a large space to make up for it. 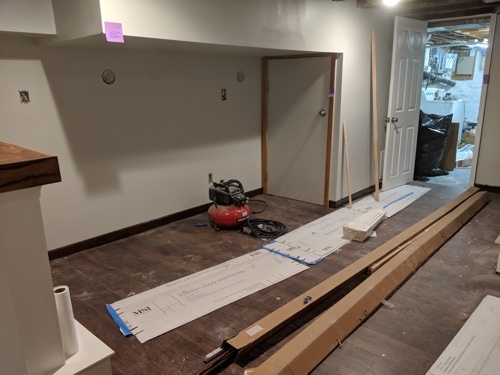 But when I finally came to terms with the fact that that would never be a (legal) bedroom, I realized there was really no reason for me to keep the wall where it was. 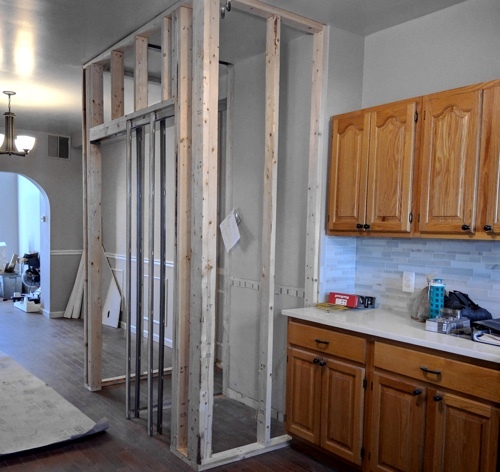 Though I groaned at the thought of causing myself yet more work, it only made sense to push that wall back and enlarge the family room. It only adds a bit under 3′, but it makes a lot of difference. The family room now feels like a nice-sized room and the “office nook” feels… smallish. :/ It’s about 10×12 now. 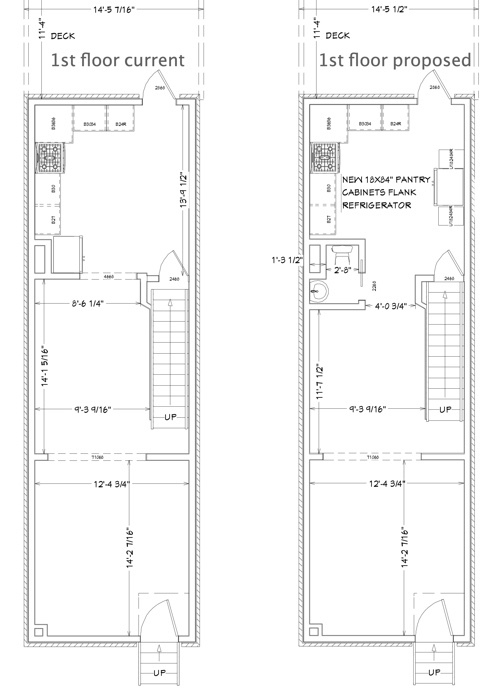 Which should be big for a room in a townhouse, but the ceilings are so low that everything feels a bit cramped. At least this new wall is built with a PT stud on the bottom (the other wasn’t) and straight (the other wasn’t) and plumb (the other wasn’t.) Even if it did cost me a half a day’s labor. I’m sloooooooow. 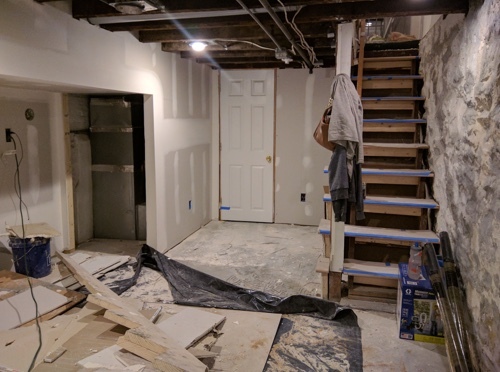 So what’s left for the basement? 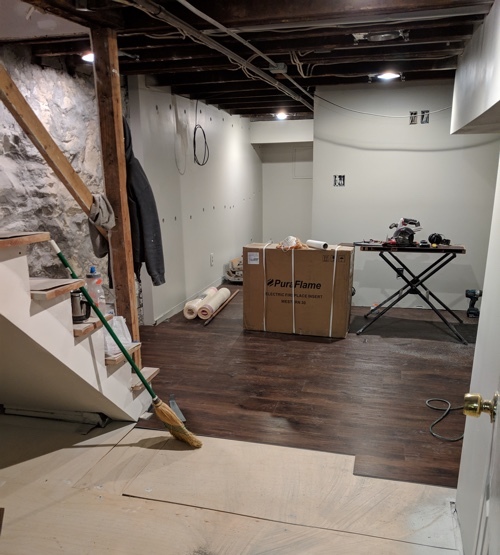 electric: can lights, outlets, separating rooms into their own switches, etc (right now the entire basement is on one single switch at the top of the stairs). 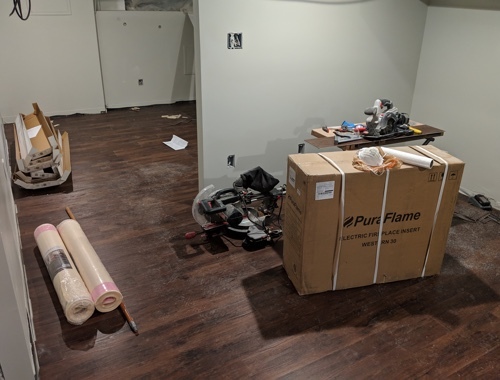 flooring: laying down moisture barrier or dimple mat, covering with luaun or 3/8″ ply, and laying (hopefully, if it’s level enough) vinyl plank. And if it’s not, carpet. Though I do hate carpet in a basement. Then trim. Ugh. I don’t like trim. painting, painting, painting. I even have to paint the ceilings. 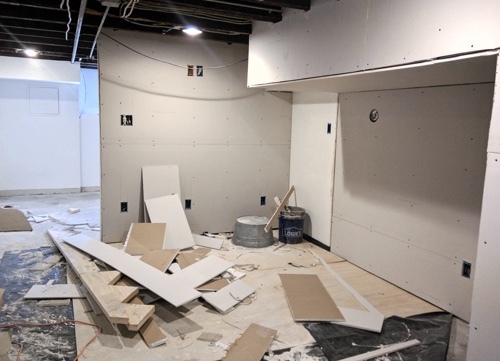 I’m going to do a “white-out” – where everything gets painted over, even ductwork and electrical wires and spiderwebs and stuff. 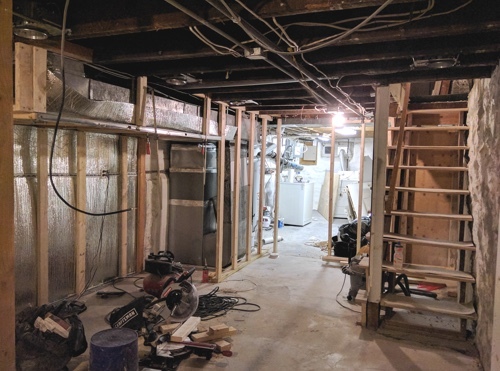 Keeping it naked – without drywall – actually makes it legal living space (according to a basement specialist contractor). Who knew. 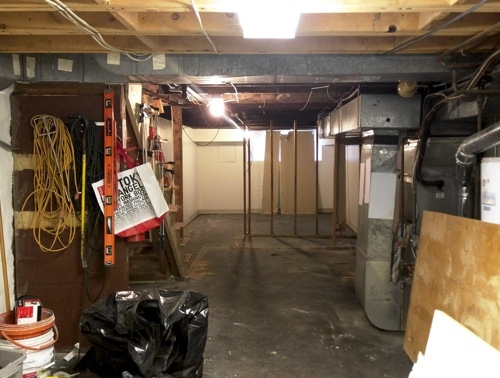 If we had a “finished” ceiling with drywall, suddenly ceiling height codes would apply and we would all go to jail and pay a million dollars in today’s monopoly money. I’m going to have to learn to use a paint sprayer. I hate learning new tools. Atom, Entries (RSS .92), (RSS 2.0) and Comments (RSS 2.0). 34 queries. 0.288 seconds. Top.